NY Pump & Motor Repair carries pump products from many top manufactures including Tsurumi. Tsurumi pumps are strong, efficient and designed for work. With a Tsurumi pump for your industrial use, you can be sure you are receiving a high quality product for years of use. Tsurumi is an industry leader in pumps and generators. From plumbing to industrial and sewage, Tsurumi pump products are created for many different types of use. Are you in need of Tsurumi pump service in Queens, NY? 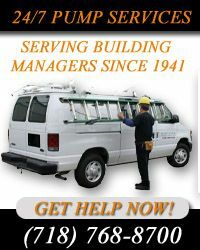 NY Pump & Motor Repair has been providing Tsurumi pump services in NYC Metropolitan area since 1941. No Tsurumi pump problem is too big or small for NY Pump & Motor Repair's technicians to handle. We understand that Tsurumi pump can occur at any time. For that reason we offer 24 hour emergency Tsurumi pump services in NYC. For more information on Tsurumi pump service in Queens, NY, call NY Pump and Motor today at (718) 768-8700!